Loco Moco is a dish native to Hawaiian cuisine. There are many variations, but the essential loco moco consists of white rice topped with a hamburger patty, a fried egg, and brown gravy. Left: Loco moco in Honolulu: two fried eggs over two hamburger patties, two scoops rice, gravy, macaroni salad and boiled soba noodles. Variations may include bacon, ham, Spam, kalua pork, Portuguese sausage, teriyaki beef, teriyaki chicken, mahi-mahi, shrimp, oysters, and other meats. In keeping with the standards of Japanese Cuisine, rice is used as a staple starch, finished off with the hamburger, gravy, and fried eggs to create a dish that does not require the preparation time of bento. Loco Moco can be found in various forms on many Pacific islands from Hawaii to Samoa to Guam and Saipan. 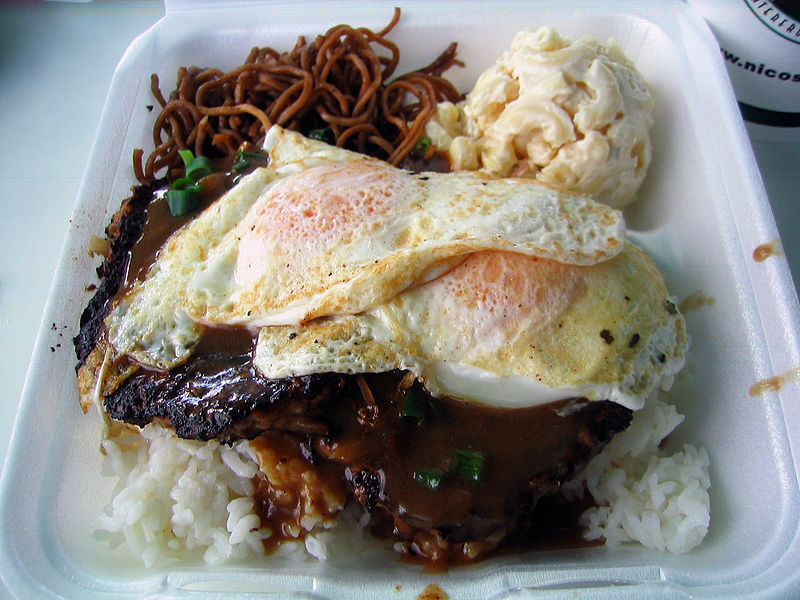 Loco Moco is also the name of a Hawaii-based restaurant chain featuring Hawaiian rice bowl dishes.